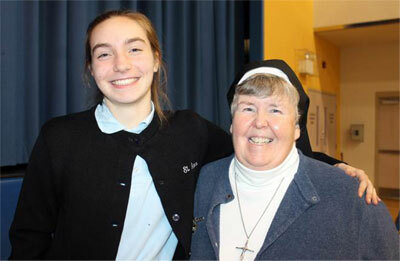 Julia Hirs (left) poses with St. Agnes School Principal Sister Joan Felicia. Julia Hirs, an eighth grader at St. Agnes School in West Chester, was named a Neumann Scholar this week by the Connelly Foundation. Along with 34 other students also named Neumann Scholars in the Archdiocese of Philadelphia, Hirs will be awarded a four-year scholarship to attend one of the 17 archdiocesan high schools of her choice. This year 900 eighth-grade students from 112 Catholic schools competed for the scholarships by taking an examination. To be eligible, eighth-grade students must have attended an archdiocesan elementary school in seventh and eighth grade, earned a 92 average or above in the first marking period this year and scored a 90 or above in the national percentile of the seventh grade Terra Nova test or have a CSI of 120 or higher. At St. Agnes, students meeting the requirements this year included Johanna Arevalo, Gabriel Arizin, Mary Byerley, Erin Byrd, Madilyn Cahill, Katherine Chevalier, Peter Dolan, Luke Ercole, Daniel Gillinger, Robert Guldi, Michael Hayes, Julia Hirs, Samantha Jones, Mac Kozinski, Riley Longenderfer, Ehrin Mears, Ashley Reilly, Rebecca Richard, Marie Shurer, Eliabeth Talluto and Maura Taylor.